Dr. Jim Erpenbach recommends that you bring your child in for their first dental visit soon after their first birthday. An early check is the first step in preventing problems and setting the stage for lifelong dental health. We will keep the visit short, but perform a thorough visual examination to make sure there are no concerns. It is especially critical to keep your toddler from eating sticky or hard candies that lodge in molars and spaces between teeth. It is also important to monitor the amount of juice they drink and keep it in a cup instead of a bottle. Other vital habits are to brush and floss your teeth in front of your child. (If you have never been regular flossing – it’s time to start!) Let them see that it is a priority and a comfortable habit in your life. Brush their teeth with a soft bristled brush and a small amount of toothpaste. Let them try it, but always go over their teeth afterward, making sure each tooth is brushed. When finished, give them a cup of water to help rinse the toothpaste out. Before coming to Jim Erpenbach DDS in Knoxville, speak with your child about the upcoming appointment and let them know that their teeth are going to be checked. Dr. Erpenbach will help your child feel proud of their effort and have a pleasant visit, the first of many to come. Call Dr. Erpenbach at 865-584-8630 to schedule an appointment. Remember also to call any time between scheduled visits with any questions or concerns that might arise. 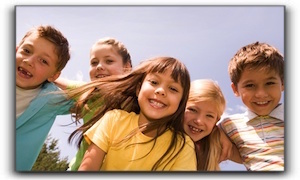 We are dedicated to your child’s lifelong dental health. Dr. Erpenbach serves many families in the Knoxville area with competence and compassion. Some of our patients come from West Lenoir City, Hardin Valley, and West Knoxville. Our most popular services include cosmetic dentistry, family dentistry and preventive dentistry. We are located at 6311 Kingston Pike, Ste 8W in Knoxville.